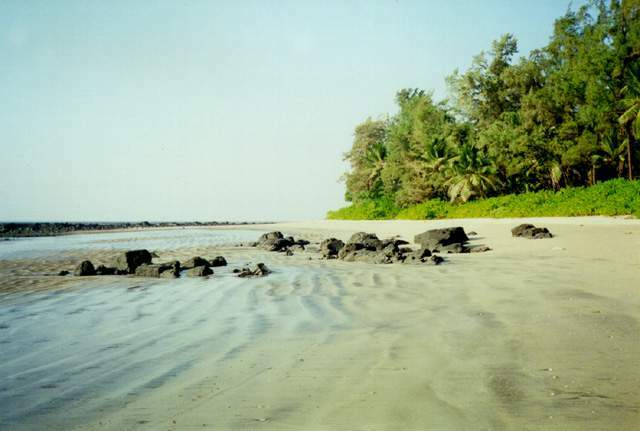 Kihim Beach is located 8 Kms north of Alibaug . It has calm and clean beach. Residential accommodation is available in Maharashtra Govt owned M.T.D.C. resort located on the beach. Kankeshwar An ancient Shankara Mandir on a hill in Kankeshwar which is located on the east of Kihim is popular place for devotees of god Shankara. Kankeshwar is also favourite of trekkers. Kihim Beach is one amongst the most popular Alibaug beaches with a long stretch of sandy beach intermitten by rocky stretches. The Khanderi and Underi forts looms over the horizon at the Kihim Beach and along with the rocky stretches offers one of the most beautiful views of the setting sun in this part of the konkan beaches. Residential accommodation is available in Maharashtra Govt owned M.T.D.C. resort located on the beach. Konkan Railway trains from CST Mumbai stop at Pen, 28 km from Alibaug , from where you can take a bus, autorickshaw or taxi. Alibaug is 108 km from Mumbai by road, a journey of 3 hours via Navi Mumbai. The quickest way to get there however would be to catch a ferry from Gateway Of India. Map : Kihim Beach Map.